Luciferian Jewish-Freemasons John Kerry and John McCain are currently attempting to start a war in Syria so that their Biblical plan of a "second coming" from Isaiah 17:1-3 can be fulfilled. According to their Bible, Damascus (the capital of Syria) must be destroyed before their Jesus (the antichrist) can come. 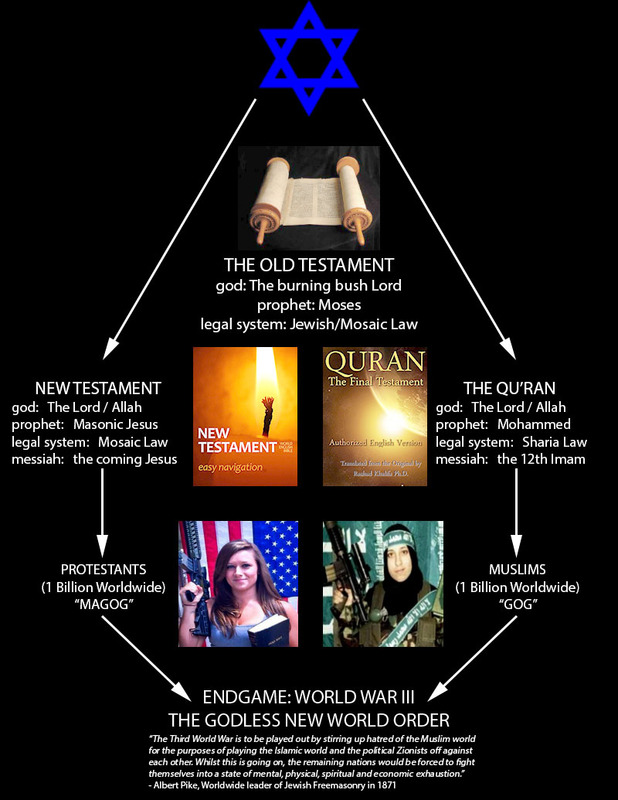 If Luciferian Jewish-Freemasonry pulls off this engineered war, which side will you be on? Isaiah 17:1-3: " The burden of Damascus. Behold Damascus shall cease to be a city, and shall be as a ruinous heap of stones. The cities of Aroer shall be left for flocks, and they shall rest there, and there shall be none to make them afraid. And aid shall cease from Ephraim, and the kingdom from Damascus: and the remnant of Syria shall be as the glory of the children of Israel: saith the Lord of hosts." "I had nothing to do with engineering this conflict between ISIS and Syria. When I hung out with ISIS leaders a few months ago, all we talked about was American Idol, I swear. America is the greatest nation on Earth and I salute her armed forces...ISIS leaders told me they support the troops as well..."
"You know, since my divorce I've accumulated so much debt that I actually want the Jewish messiah to come. As long as the Vatican releases their Project X gold holdings to coincide with their presentation of the Masonic Lord Jesus of Apocalypse 22:17, I will welcome him with open arms. Come Lord Jesus of the Apocalypse!" "When Teresa and I dined with President Bashar al-Assad of Syria, that jerk stuck me with the bill. It's like Assad thinks I have a special relationship with the Jews that print our money. I might have to go with John McCain and ISIS on this one."